Cochlear Implants technology has evolved over the years from a single electrode device, to a system that transmits sound information through multiple electrodes. 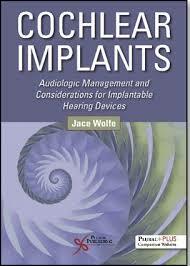 Cochlear implants were first developed in the 1960s in France. Since this development, more than 30,000 people have had implants of various forms. The cochlear implant technology has evolved over the years from a single electrode device, to a system that transmits sound information through multiple electrodes. Controversy surrounds this device, however, in accordance with determination of appropriate candidates, choice of single-electrode or multi-electrode device, suitable assessments after implantation, and rehabilitation procedures. The ear is divided into three parts, the external ear, the middle ear and the inner ear. When sound travels across the external ear and through the ear canal, the sound waves cause the eardrum to vibrate. This vibration is processed through to the cochlea or auditory chamber in the inner ear by way of the three small ear bones of the middle ear, the malleus, incus, and stapes. The fluid waves in the cochlea then stimulate the more than sixteen thousand delicate hair cells or hearing cells. The movement of these hair cells stimulates the auditory nerve with an electrical current. This in turn travels to the brain stem and on to the portion of the brain that recognizes sound. When the external ear or middle ear experience an obstruction, hearing impairment results. There may be various reasons for the impairment and it can be remedied through medication or surgery. When the hearing loss is in the inner ear, it is caused from nerve damage. In most cases of sensorineural hearing loss, it is the hair cells that are damaged and do not function. The auditory nerve may be capable of transmitting electrical impulses, but without the hair cells maintaining any function, the auditory nerve remains un-stimulated. Hearing loss of this nature cannot be treated medically. The cochlear implant is designed to bypass the non-functioning hair cells, and stimulate the auditory nerve. The cochlear implant is designed for individuals who receive little or no benefit from a traditional hearing aid. The implant consists of a microphone, a signal processor, a signal receiver, and one or more electrodes, implanted around the cochlea. The microphone and receiver are worn outside the body, like a hearing aid. A transmitter outside of the body with a receiver inside, or a connector that protrudes though the skin just behind the ear, may be used. Either way, a direct connection is made between the signal processor and the electrode. The electrical stimuli are sent to the implanted electrodes, and on to the auditory nerves that will signal the brain. Paper Masters writes custom research papers on Cochlear Implants and looks into this controversial device and explains how it works.